Intelligent Mail barcodes are used in the USPS mailstream to increase the efficiency of deliveries. Intelligent Mail barcodes combine routing ZIP code information and tracking information into a single 4-state code. It encodes data from POSTNET and PLANET barcodes into a single barcode while providing a greater range of tracking data. 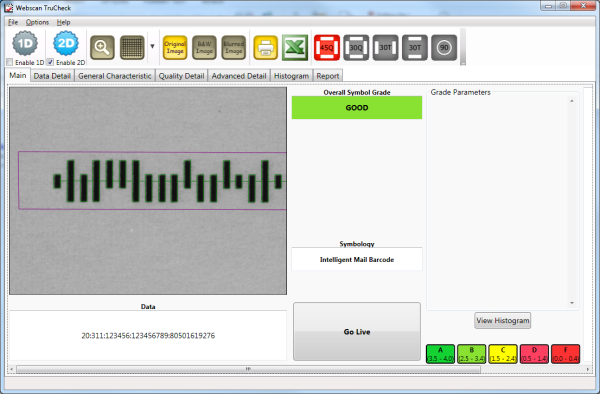 Support for Postnet and Intelligent Mail Barcode (IMB) is available as an optional feature in Webscan bar code verifiers. To enable this feature, a license file must be purchased and loaded into the verifier unit (under the Help Menu, Activate Feature). The license file is tied to the “Board Serial Number” found in the Help About window in the software.